Your dream of a warm and cozy abode, light on pocket as well as an impressive luxurious home can come true at De Panache. This 1450sq ft mock up apartment is designed with minimalistic interiors. 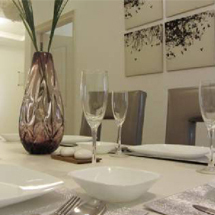 The subtle colours complements our signature style giving the apartment an elegant look. 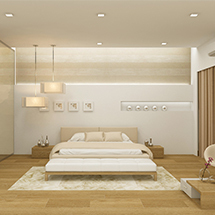 The light hued walls make the living space roomy. 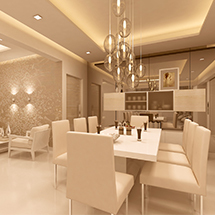 The accent wall in the living room is clad with 3D chips stone mosaic and the crystal chandelier makes it capacious. 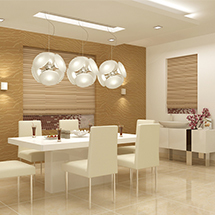 The beautiful dining space makes you look forward to a happy gathering over meal time with your folks. After an exhausted day, when your body anticipates the much needed siesta the beautifully designed bedroom gives you the serene space to rest. The use of natural stone at the headboard creates an amazing drama. The perfect white backdrop makes it alluring. 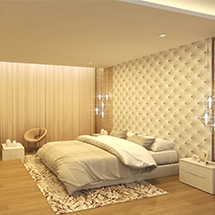 The warm white light and pastel colours used in the guest bedroom is appealing to the eyes. The beige and vibrant red artefacts makes the room very cozy.